GFMC staff Ms. Michaela Spielmann taking over temporarily position of GFMC General Manager and administration of GFMC Fire Paradox (until end of February 2009; D. Kraus to return from leave). Temporary GFMC staff Mr. Sundar Sharma returning to Nepal. Development of a regional wildland fire policies in Madagascar (Boeny and Diana regions) and inclusion of Madagascar to the UNISDR Global Wildland Fire Network / Regional Sub-Sahara Africa Wildland Fire Network (J.G. Goldammer); Antananarivo – Mahajanga, Madagascar. Government of Nepal endorses final work plan for the project Development of a Forest Fire Management Strategy and Implementation Plan for Nepal; with Emphasis on Community Participation and Regional Cooperation sponsored by the International Tropical Timber Organization (ITTO), to be implemented by the GFMC (J.G. Goldammer) and the National Chapter of the UNISDR Regional South Asia Wildland Fire Network (S. Sharma) between 1 February and 31 July 2009; Katmandu, Yokohama, Freiburg. 2nd Workshop on fire detection and assessment of fire use patterns through the Multidisciplinary Landscape Assessment (MLA2) with training field exercise (D. Kraus); Mukteshwar, Uttarakhand, India. GOFC-GOLD international telephone conference (J.G.Goldammer); AT&T. Pan-Asia Forest Fire Consultation for the UNISDR Regional Wildland Fire Networks of Northeast Asia, Central Asia, Southeast Asia (ASEAN), and South Asia (J.G. Goldammer); Busan, South Korea. Coordination meeting Fire Paradox project on the preparation of the Prescribed Burning Technical Handbook for Europe (M. Spielmann); Brussels, EC, Belgium. Aerial Fire Fighting Conference (J.G. Goldammer); Anaheim, California. Max Planck Institute for Chemistry Scientific Advisory Board meeting and institute review (J.G. Goldammer); MPI Chemistry, Mainz, Germany. Training course Intermediate and Advanced Incident Command System, an activity of the Working on Fire / AfriFireNet / UNISDR Regional Subshara Wildland Fire Network / GFMC (A. Held, D. Kraus); Sunwa Resort, Parys, South Africa. Mr. Fabian Poeschel, Hochschule für angewandte Wissenschaft und Kunst (FH), Goettingen, joining GFMC for developing a BSc thesis on Objectives and practices of prescribed burning in nature conservation, landscape management and forestry in temperate-boreal Europe; GFMC. Prescribed burning operations in Drover Heide Nature Reserve. Experimental fires to regenerate overmature Calluna vulgaris heath (M. Spielmann; with René Mause, Biological Station, Düren County); Nideggen-Brück, Germany. Prescribed burning operations in Mehlinger Heide Nature Reserve. Experimental fires to regenerate overmature Calluna vulgaris heath (J.G. Goldammer, F. Poeschel); Mehlingen, Germany. Initiation of the field work and stakeholder consultations of the project Development of a Forest Fire Management Strategy and Implementation Plan for Nepal; with Emphasis on Community Participation and Regional Cooperation, sponsored by the International Tropical Timber Organization (ITTO), to be implemented by the GFMC (J.G. Goldammer) and the National Chapter of the UNISDR Regional South Asia Wildland Fire Network (S. Sharma) (see 22 February 2009); Kathmandu, Hetauda, Nepal. Nineteenth Session of the FAO Committee on Forestry (COFO) and World Forest Week, with meetings of the Fire Management Actions Alliance and the International Liaison Committee for Wildfire 2011 (J.G. Goldammer, A. Held); COFO-19 Special Event on Fire and Climate Change, with GFMC contribution Vegetation fires and climate change interactions (J.G. Goldammer); FAO, Rome, Italy. Intergovernmental Panel on Climate Change (IPCC) Scoping Meeting for a potential Special Report on “Extreme Events and Disasters: Managing the Risks” (J.G. Goldammer); Oslo, Norway. Inauguration Meeting of the UNECE/FAO Team of Specialists on Forest Fire for the work period 2008-2013 (J.G. Goldammer); United Nations, Palais des Nations, Geneva, Switzerland. Meeting of the Joint UNECE/FAO Timber Committee / European Forestry Commission Bureaux and the Leaders of the UNECE/FAO Teams of Specialists (J.G. Goldammer); United Nations, Palais des Nations, Geneva, Switzerland. Prescribed burning operations within the EU-sponsored LIFE Rohrhardsberg project. Testing the use of prescribed fire in maintaining landscape and ecosystem structures in grazing systems in the Black Forest (A. Held, D. Kraus); Prechtaler Schanze, Oberprechtal, Germany. Conference of Directors of UNU Research and Training Centres/Programmes (CONDIR 37) at the Swiss Federal Institute of Technology (ETH) (J.G. Goldammer); Zurich, Switzerland. Briefing of the Deutsche Gesellschaft für Technische Zusammenarbeit GmbH (GTZ) (German Agency for Technical Cooperation), on the three-level national fire management project Integrated Wildland Fire Management and Wildland Fire Disaster Prevention in Mongolia, funded by the German Federal Ministry for Economic Cooperation and Development (BMZ) and commissioned by the Deutsche GTZ – Advisory Project Disaster Risk Management in Development Cooperation on behalf of the BMZ. The project was implemented by the Global Fire Monitoring Center (GFMC) on behalf of the Mongolian-German project Conservation and Sustainable Management of Natural Resources (J.G. Goldammer); GTZ Eschborn, Germany. 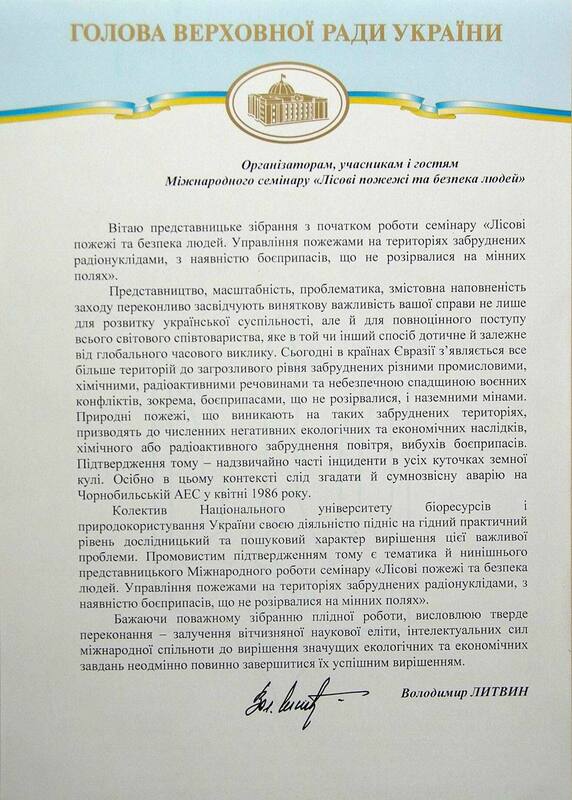 Rapid fire management planning support mission to Kazakhstan (J.G. Goldammer); Almaty, Kazakhstan. Briefing of NaturSchutzFonds Brandenburg for the development of a project for prescribed burning in Heidehof-Golmberg and Jägersberg-Schirknitzberg Nature Reserves in the frame of an overall management concept on UXO-contaminated terrain (J.G. Goldammer); Eberswalde, Germany. FAO Wildland Fire Management Training Course (A. Held); Addis Ababa, Ethiopia. Work exchange of GFMC staff as Fire Analyst Assistant to UT GRAF (D. Kraus); Tivissa, Spain. UN Advisory Group on Environmental Emergencies (AGEE) 8th meeting, co-organized with the Monitoring and Information Centre (MIC) of the European Commission (J.G. Goldammer); European Commission, Brussels. International Liaison Committee (ILC) visit to AfriFireNet / Working on Fire (WoF) headquarters (J.G. Goldammer, A. Held), Nelspruit, South Africa. ILC Preparatory Meeting for the 5th International Wildland Fire Conference 2011 “WildFire2011”. The WildFire 2011 National Organizing Committee and the Scientific Advisory Committee to present the current status of preparation and future action items (J.G. Goldammer, A. Held); Sun City / Pilanesberg National Park, South Africa. Meeting on Bilateral Wildfire Agreements and International Exchange Programs (J.G. Goldammer, A. Held), Pretoria, South Africa. GOFC-GOLD Fire IT telephone conference (J.G. Goldammer); AT&T / University of Maryland / GFMC. Fire analysis training with UT GRAF (A. Held); Tivissa, Spain. NATO Advanced Research Workshop on Use of Satellite and in Situ Data to Improve Sustainability with contributions Early detection and monitoring wildland fires from satellite and in situ data: Preparedness and response (withBill de Groot and Sergiy Zibtsev) and Wildfires in the irradiated forests around the failed Chernobyl nuclear power plant: Needs for development of early warning, detection and monitoring capacity for disaster risk reduction (with Sergiy Zibtsev and Chad Oliver) (J.G. Goldammer); Kiev, Chernobyl, Ukraine. Business meeting regarding involvement in WildFire 2011 with European General Dealer of AirTractor (A. Held), Barcelona, Spain. XXe Rencontre du Réseau des Èquipes de Brulage Dirigé (D. Kraus); Tarascon sur Ariége, France. Second meeting of the UNISDR Global Platform for Disaster Risk Reduction, with GFMC Side Event Global Change and Wildfire in which the White Paper on Vegetation Fires and Global Change will be introduced to the UN system (18 June 2009) (J.G. Goldammer); Geneva, Switzerland. Opening ceremony of the global platform. Wildfire 2009 conference, Presentation on ICS experiences in South Africa (A. Held), Lyndhurst, New Forest, Hampshire, United Kingdom. Fire Management Training Course  Southern Caucasus Region, conducted in the frame of the ENVSEC / GFMC project Enhancing National Capacity on fire Management and Risk Reduction in the South Caucasus (J.G. Goldammer, with L. Kondrashov, E. Bilgili and N. Nikolov); Borjomi National Park, Georgia. Defense of BSc thesis of Mr. Fabian Poeschel on Evaluation of objectives and practices of prescribed burning in nature conservation, landscape management and forestry in temperate-boreal Europe (Auswertung der Zielsetzungen und Praktiken des kontrollierten Brennens in Naturschutz, Landschaftspflege und Forstwirtschaft im gemäßigt-borealen Europa) (J.G. Goldammer); Hochschule für Angewandte Wissenschaftund Kunst, Göttingen, Germany. Meeting with Stihl Germany on development of firefighting tools; GFMC. Change of Command Ceremony for 4 ASOG, Third Air Force (J.G. Goldammer); U.S. Air Force, Heidelberg, Germany. Visit of a forestry delegation (Head of Provincial Forest Service of Gansu Province; Director and staff of the Academy of Water Resource Conservation Forest, Qilian Mountains, Gansu Province), People’s Republic of China, on fire management in Qulian Mountains; GFMC. Meeting with Federal German Technical Relief Agency (Bundesanstalt Technisches Hilfswerk – THW), Federal German Ministry of Interior, Frankfurt Fire Service, Rottenburg University for Applied Forest Science and GFMC (J.G. Goldammer), on a concept for capacity building in wildland fire management in Germany; THW Berlin, Germany. Work visit to Professor John Dold, Manchester University, Fire Research Center, discuss fire research in Southern Africa; Fire Training Exchange introduction Fire Service North Ireland (pending), Fire Training Exchange introduction Northumberland Fire Service (A Held); United Kingdom. Work visit of the Economic and Environmental Affairs Officer of the Organization for Security and Co-operation in Europe (David Swalley); GFMC. Work visit with Federal Forest Service of Russia and the Russian Aerial Fire Protection Service Avialesookhrana (J.G. Goldammer); Moscow / Pushkino, Russian Federation. On 25 August 2009 the Federal Forest Agency, Ministry for Agriculture, Government of Russia, awarded the Memorial Medal of the Federal Forest Agency (the highest national Russian Forestry Award) to Johann G. Goldammer, Moscow, Russian Federation. Work visit at the All-Russian Research Institute of Silviculture and Forestry Mechanization, Ministry of Agriculture of Russia, Laboratory of Radioecology, in preparation of the Advanced Seminar Wildfires and Human Security – Fire Management on Terrain Contaminated by Radioactivity, Unexploded Ordnance (UXO) and Land Mines (Kyiv / Chernobyl, Ukraine, 6-8 October 2009) (J.G. Goldammer); Pushkino, Russian Federation. Final workshop of the project “Forest Fires in India: Integrating ecological and cultural contexts and consequences” (project sponsored by the Federal German Ministry for Economic Cooperation) (D. Kraus); Delhi, India. European Science Foundation (ESF) Exploratory Workshop on Improved Quantitative Fire Description With Multi-Species Inversions of Observed Plumes (J.G. Goldammer, M.O. Andreae); Farnham Castle, United Kingdom. Workshop Managing military training areas of high ecological value in Central and Eastern Europe (CEE), organised by the Bavarian Academy for Nature Conservation and Landscape Management and Naturstiftung David in cooperation with CEEweb, with GFMC presentation Fire use on military training sites  Techniques and applications: Fire as a tool in the land managers tool box (D. Kraus, A. Held); Passau (Germany) / Boletice (Czech Republic). 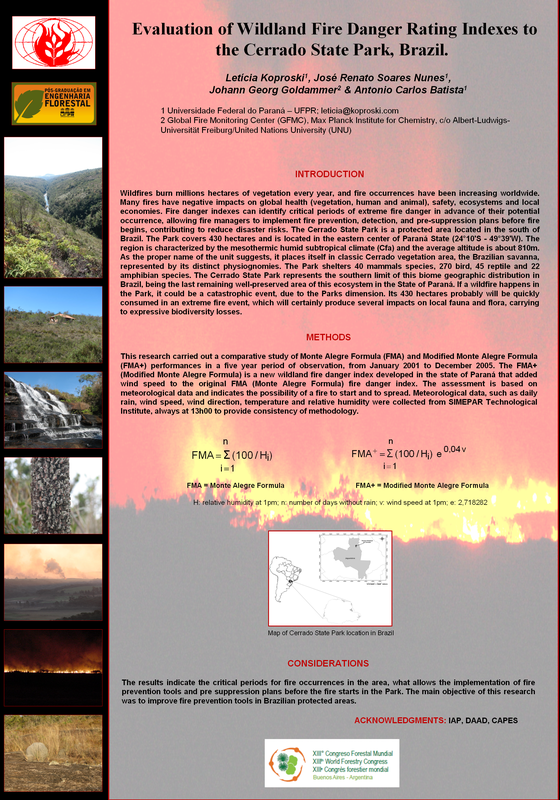 4th Brazilian-German Symposium on Sustainable Development (IV Simpósio Brasil-Alemanha  Desenvolvimento Sustentável), with GFMC contribution on Fire risk mapping for the Cerrado State Park, Jaguariaíva (PR), Brasil. (by L. Koproski, J.G. Goldammer); Curitiba, Brasil. Work visit of the Coordinator of the UNISDR Regional Central Asia Wildland Fire Network, Leonid Kondrashov, for coordination with GFMC and UN SPIDER / UNOOSA; GFMC. 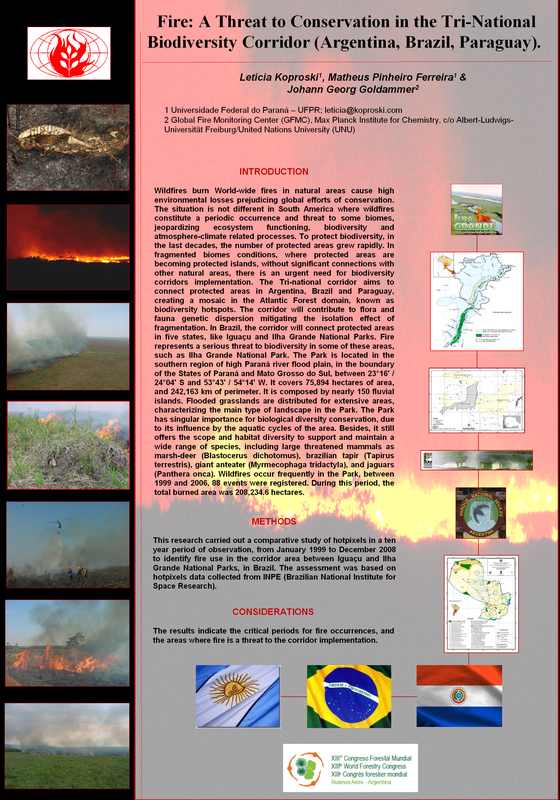 XVIII World Forestry Congress, with GFMC contributions on Fire: A Threat to Conservation in the Tri-National Biodiversity Corridor (Argentina, Brazil, Paraguay), and Evaluation of wildland fire danger rating indexes to the Cerrado State Park, Brazil (by L. Koproski and J.G. Goldammer) (L. Koproski); Buenos Aires, Argentina. Meeting of the Board of Directors of the Fire Paradox Integrated Research Project (EU) in preparation of the closing meeting (February 2010, hosted by GFMC and EFICENT) (M. Spielmann, D. Kraus, A. Held, J.G. Goldammer); GFMC. Kickoff meeting of the project ALP FFIRS (Alpine Forest FIre waRning System): The forest fire danger prediction in the Alps (Alpine Space Programme), with GFMC observer contribution The Global Wildland Fire Early Warning System and ALP FFIRS: Towards an integrated approach (J.G. Goldammer); Turin, Italy. Conference Working on Fire: Future Challenges in Firefighting, in the frame of HeliWorld International Conference and Airtec 2009, co-sponsored by GFMC, Working on Fire International and European Rotor and Rescue Conferences, with GFMC Contributions International Strategy for Disaster Reduction (by J.G. Goldammer), The African Experience in Aerial Firefighting: Lessons identified for common wildfire problems (by A. Held), and Basics and Concepts of Fire Analysis (by D. Kraus); Frankfurt, Germany. Work meeting with UT GRAF to discuss the development of a qualification system and assessment procedures (M. Bruce, A. Held, D. Kraus); Barcelona, Spain. Aerial Firefighting International Conference and Exhibition, cosponsored and under the auspices of GFMC / UNISDR Wildland Fire Advisory Group / Fire Aviation Working Group, with GFMC contribution Aerial Fire Fighting During Armed Conflicts and in Contaminated Terrains (by J.G. Goldammer); Rome, Italy. GFMC contribution to the 45th session of the International Tropical Timber Council (ITTC), International Tropical Timber Organization (ITTO), in preparation of fire management projects in ITTO member countries and preparation of WildFire 2011 (J.G. Goldammer); Yokohama, Japan. Work meeting with UCM for preparation of a booklet on best practice examples for prescribed burning in Europe in the frame of Fire Paradox (D. Kraus); Madrid, Spain. General assembly of the German Committee for Disaster Reduction (DKKV) (J.G. Goldammer); Bonn, Germany. Training course on High Reliability Organizing (HRO) and Leadership concepts for European fire managers (D. Kraus); Girona, Spain. Jornadas Técnicas del Cuerpo de Bomberos: Capacidad de gestión de los incendios forestales (D. Kraus), Girona, Spain. Fire Paradox workshop series to review guidelines and manuals for the prevention and extinction of Large Wildfires (D. Kraus); Girona, Spain. Annual course “Fire Ecology in Ecosystems of the Tropics and Subtropics”, Faculty for Forest and Environmental Sciences, Freiburg University (Germany), given by GFMC staff (J.G. Goldammer, A. Held, D. Kraus, S. Maisch); Freiburg, Germany. Seminar on “Basic Principles of Fire Ecology and Wildland Fire Suppression” at Brandenburg Technical University (Germany), given by GFMC staff (A. Held, D. Kraus); Cottbus, Germany. International telephone conference of the UNISDR Fire Aviation Working Group (U.S.A., Australia, Canada, GFMC). Fire risk assessment technical workshop (Fireglobe Project), University of Alcalá (J.G. Goldammer); Alcalá de Henares, Spain. CTIF Forest Fire Commission meeting, (A. Held), Chelmsford, United Kingdom. Fifteenth session of the Conference of the Parties (COP), UN Framework Convention on Climate Change (UNFCCC). GFMC virtual participation and presentation through the German Committee on Disaster Risk Reduction (Deutsches Komitee für Katastrophenvorsorge  DKKV) at DKKV Side Event on 8 December 2008, 20:00-21:30h, room Saxo Grammaticus; Bella Center, Copenhagen, Denmark. Meeting of the Steering Committee, UN Advisory Group On Environmental Emergencies (AGEE) (J.G. Goldammer); Palais des Nations, Geneva, Switzerland. Colloquium Fire in Human Evolution, Human History, and Human Society, Koninklijke Nederlandse Akademie van Wetenschappen (KNAW), with GFMC contribution Vegetation Fires and Global Change (J.G. Goldammer); Amsterdam, Netherlands. GFMC greetings for 2010: Happy New Year to all colleagues, cooperators and especially the members of the Global Wildland Fire Network.